Thus the Keynote (or more usually PowerPoint) part of the presentation tends to happen at quite a late stage and when it does happen, it tends to be quite intensive and focused, as I have done all my basic thinking by then. So I get really jangled when anything holds up my flow as I’m building the physical presentation. If I’m working on a Mac, I generally have Keynote or PowerPoint on my main monitor, with iPhoto and Firefox open on the second monitor and, if I need to fiddle with images, PhotoShop running in the background on the main monitor. If I’m working to a tight script (and I usually am), I’ll have the Word document with the verbiage up on my second monitor. With this setup, I can work seamlessly, flipping back and forth between apps, like a somewhat rotund Flying Wallenda. I was working at home over the weekend on a piece for a client in PowerPoint 2007 using a Dell laptop running Windows Vista. The first thing I noticed was the lack of desktop acreage really slowed me down. I was flipping between the script and the PowerPoint file quite comfortably; but whenever I needed to rummage out an image or check a detail on the web, things started running like molasses and that spinny blue wheel thing gets really tiresome after a while. I ended up printing out the Word doc, just so I could close that app and spend a little less time waiting for the computer to get its act together. Oh – and my favourite! Every time I plugged a USB stick into the Vista machine, the same rigmarole took place. It thought about it for a little while and then popped open a window offering me a dozen alternatives as to what I could do, including the thing I did every time, which was open the stick in a new folder and review the files in it for copying and transporting. Every time. Somewhere around the seventh time, a persistent tic began above my left eye. I haven’t had to work from scratch like this on a Vista machine for quite a while and I pity anyone who has to work in this way on an ongoing basis. With 4GB of RAM and a reasonably zippy chip, all the upgrades and patches known to man and (if I say so myself) unstinting patience on my part I still spent an inordinate amount of time watching the spinny wheel while the computer took its own sweet time to wind down one operation and slowly grind another up to speed. Maddening! My desktop machine at the office is a pre-Intel Mac, with just 2GB of RAM and yet it runs all those apps, and three times the pixel acreage of desktop, with nary a delay in sight. Also, it has iPhoto, which is an invaluable archiving tool for image libraries. This media library is built into Keynote, but is nearly as quick to use with PowerPoint if it’s open on a separate monitor. Most of the blurb out there on the app stresses its use as a family-and-friends-happy-memories tool. But it is a superb image library in its own right for stock photography and other images. You can search in an instant and export images to whatever size you specify, or just drag them across onto your presentation. I haven’t experimented yet with building a photo library on my Vista machine and, given my experiences of the operating environment thus far, I’m not going to bother. I’ve said it before and I’ll say it again: I will have no truck with tools that answer me back. If I pick up a hammer, it’s because I want to drive a nail into a wall, not because I want to have a conversation with my hammer about whether I really want to drive a nail today, and have I considered using rawlplugs and screws, and anyway don’t I want to upgrade to Hammer Service Pack 23? I’m no evangelist for anyone, but I have found a way of working that means my tools never, ever, argue with me. I can see why so many people still use built-in templates and death by bullet point – using the system I was on over the weekend, anything else is just too much like hard work! If you have to create a lot of presentations, I would suggest that you look around and make sure that you have the optimal toolset for the job. If I went back to Dell and told them I wanted a refund on my Inspiron because it was “not fit for purpose,” due to an operating system that renders it effectively worthless to me, I don’t suppose I’d get very far. I wonder what would happen if 10,000 people did the same thing at the same time? Or a million? From what I understand, the market has roundly rejected Vista and no one in Microsoft seems to want to talk about it at all – mumbling on endlessly about Windows 7 instead. 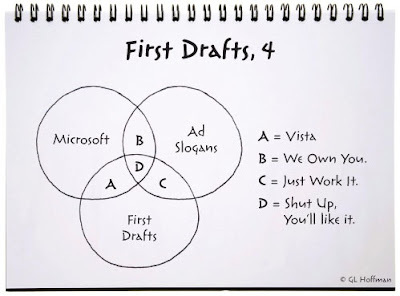 All I will say is that if you are looking for a productive workflow to produce anything other than an endless stream of bullet points, avoid Vista like the plague it is.